She passed her examinations for the degrees of Master of Sciences in Orthodontics (MSc in Orthodontics) by the University of London, UK in 1995 and both Memberships in Orthodontics (M.Orth RCS) by the Royal Colleges of Surgeons, Edinburgh and England in 1996. She was admitted as a Fellow of the Academy of Medicine, Singapore (FAMS Orthodontics) and entered into the Academy of Medicine’s Roll of Specialist in 2003. Dr. Audrey Tan joined Mount Elizabeth Orthodontic Clinic in 2009. 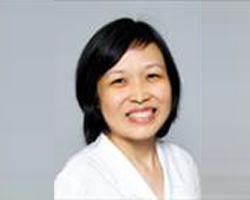 She shares Dr. Lim’s treatment philosophy and is particularly known to her patients for her patience, gentle and approachable demeanours.